The northern mockingbird is a relatively unremarkable bird to look at but a spectacular one to listen to. With its amazing ability to mimic other bird songs and sounds, the scientific name polyglottos (“many-tongued”) is very apt for this member of the Mimidae bird family. As the state bird of Arkansas, Florida, Mississippi, Tennessee and Texas, this bird is widespread and well known, but how much do you really know about it? These facts are sure to surprise you! Northern mockingbirds may seem bland with their gray, black, and white plumage, but they are elegant and bold, with several key traits that help birders identify them. Male and female mockingbirds look alike with a medium gray head and back, darker wings with two thin white bars, and bold white wing patches. The tail is dark gray or black with white outer feathers and the chest and abdomen are white or grayish-white. These birds have a faint black stripe along the lores from the bill to the eye. In flight, the white outer tail feathers and white wing patches flash noticeably. The eyes are yellow-brown and the legs and feet are black or dark black-gray. Juvenile birds look similar to adults but may have a scruffier appearance. Very young northern mockingbirds show gray spotting or mottling on the breast and flanks and may even have thin eyebrow plumes that stand out on their faces. The northern mockingbird’s voice is its most distinctive characteristic. Not only does the bird have its own unique warbles, buzzes, and chirps, but studies have found mockingbirds to mimic the calls and songs of at least 50 other birds as well as other animals, machinery, and music. Calls are generally repeated 3-5 times before changing, and the complexity and variety of one bird’s calls indicate its maturity and experience. With such a repertoire, it is not unusual for these birds to sing throughout the night, particularly in bright moonlight, as well as for several hours during the day. Northern mockingbirds are called “northern” because most mockingbird species reside in the tropics, but this species is found in North America and even some southeastern sections of Canada. These birds are highly adaptable and can be found in farmland, suburban areas, forests, and towns as far north as Massachusetts and Connecticut to Oklahoma, New Mexico, Arizona, and along coastal California. They prefer relatively dense thickets and scrub-like areas, including riparian corridors, overgrown fields, woodland edges, and similar habitats, particularly where thorny plants are abundant. The northern mockingbird’s territory is gradually expanding further north as food sources expand. Northern mockingbirds are generally year-round residents of their range and are able to adapt to typical seasonal changes. Extreme northern populations, however, may migrate seasonally, particularly during harsh winters. These birds are generally found alone or in pairs, but they will boldly perch in open areas or forest fringes to sing. They frequently run and hop to forage for insects on the ground and may snap or raise their wings up quickly to startle their prey. Northern mockingbirds are very defensive of their nests and will dive, flash their wings, or otherwise use threat postures to intimidate intruders. Mockingbirds have even been recorded as mobbing and diving at humans who venture to close to nesting areas. Similar territorial behaviors are also noted around prime feeding areas, including backyard feeders. Northern mockingbirds are omnivorous and will feed on a wide variety of foods. Insects, worms, fruit, berries, small animals, snakes, lizards, and even sap may be part of their diet depending on what foods are abundant in different areas and seasons. These birds' adaptability to different foods is critical to help them stay in their range at different times of year. These are monogamous birds that form long-term pair bonds and may even mate for life. Their cup-shaped nests are constructed of twigs and lined with finer grasses. Nests are positioned 3-10 feet above the ground, often in a thorny bush or dense thicket. Males may start building nests to entice females to mate, but the female generally chooses the final nesting location and completes the work on the nest to her satisfaction. Northern mockingbird eggs are buff or tan-colored and liberally sprinkled with darker brown or tan spotting. The female parent will incubate a brood of 3-6 eggs for 12-13 days, and both parents will feed the nestlings for 11-13 days. Pairs can raise 2-3 broods per year, and juvenile birds often remain with their family group even while a new brood is being cared for. In the 1800s, mockingbirds were often poached and sold as pets and cage birds. Today, that practice has ended and while northern mockingbirds are not considered threatened or endangered, they suffer from several risks, particularly in urban and suburban areas. Because they often forage on the ground, feral cats and outdoor pets can be a great problem, and the overuse of pesticides and insecticides can eliminate their food supplies. Minimizing these artificial threats can be very helpful for preserving northern mockingbirds. Northern mockingbirds readily visit feeders where bread scraps, suet, peanut butter, sunflower seeds, apples, and raisins are available. To make the habitat even more attractive and invite the birds to sing, birders should leave brush and trees unpruned to provide ample perching areas. Providing berry bushes for birds and suitable open space for foraging will make a yard even more attractive to mockingbirds. Because northern mockingbirds are so adaptable, they are not difficult to find within their range. They tend to prefer relatively open areas such as parks and roadsides planted with scattered trees, or they can be found foraging in athletic fields in urban and suburban areas. Watch and listen for northern mockingbirds singing from high, open perches, particularly from late winter through late spring. Also be on the lookout for these birds' territorial behaviors, including how they chase other birds such as jays, crows, grackles, and even raptors away from nesting areas or prime food sources. The northern mockingbird, with its larger-than-life personality and widespread adaptability, is one of the most popular state birds. It is the official feathered ambassador of five states: Arkansas, Florida, Mississippi, Tennessee, and Texas, and was formerly also the state bird of South Carolina, until that state switched to honoring the Carolina wren in 1948. The Mimidae bird family is a diverse one with more than 30 species of thrashers, tremblers, catbirds, and mockingbirds. 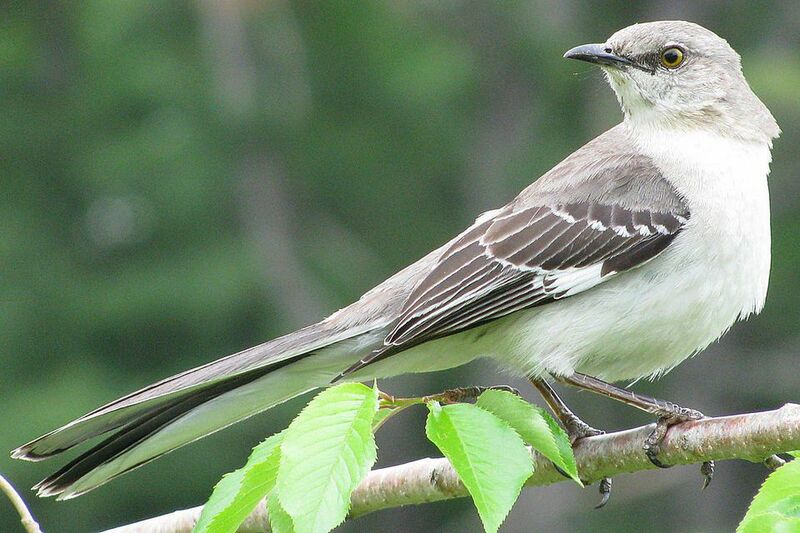 Several birds from other families also resemble the northern mockingbird and could be confusing in the field, however. For example, the blue-gray gnatcatcher can look like a miniature mockingbird with similar coloration, a long tail, and active, flitting behavior, and the bushtit also has similar characteristics. Don't miss our other detailed bird profiles for more information about all your favorite bird species!